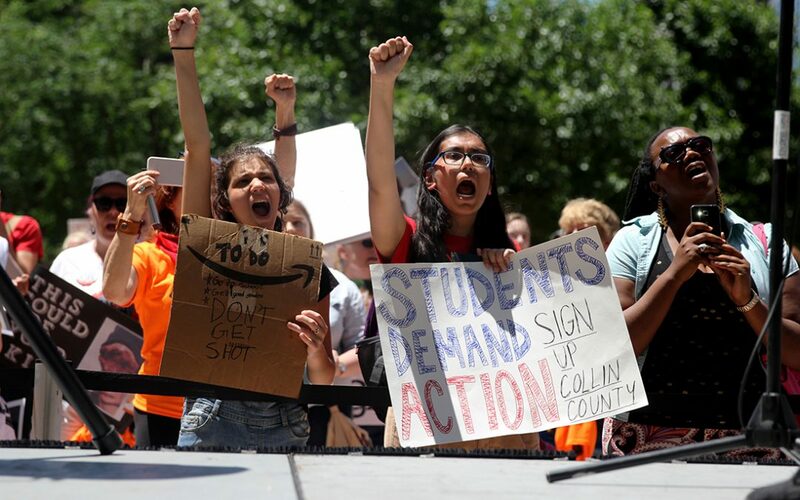 DALLAS – Hundreds of students from around the country protesting gun violence faced off against a smaller group of gun supporters, many of whom were carrying their weapons, a few blocks from the massive annual conference of the National Rifle Association on May 5, 2018, in Dallas, Texas. But many of the millennials on both sides of the argument agreed on one idea: the need for strong universal background checks. Supporters of stricter gun regulations held rallies outside Dallas City Hall and in Belo Garden Park on Saturday. The speakers included parents of shooting victims killed in the Parkland and 2012 Aurora theater shootings. The parents described to the crowds what their children experience in the final moments of their lives. At one point, a heckler with a bullhorn tried to shout down a speaker. During the rally at City Hall, Manuel Oliver, an artist and the father of Parkland shooting victim Joaquin Oliver, extended an open invitation to President Donald Trump to come to his home and spend five minutes in his son’s empty bedroom. According to NRA spokesperson Dana Loesch, over 87,000 members of the NRA and supporters attended the annual conference, which took place seven months after the Las Vegas shooting claimed the lives of 58 concertgoers and injured hundreds more. It was six months after the Sutherland Springs shooting that claimed the lives of 27 and injured 20 during a church service in Texas. And it was less than three months after the Parkland shooting claimed the lives of 17 at Marjory Stoneman Douglas High School and injured 17 others in Florida. But the protesters wanted the NRA to hear a different message: They will fight for universal background checks. That message also came from a number of young gun owners. Both sides want to increase the age limit from 18 to 21 years old to purchase a firearm and to allow police officers to take firearms away from someone who exhibits erratic behavior or is seen as a danger to themselves or others. “The whole reason that we’re for the universal background checks is because the vast majority of the American public support it,” said Claire Cahoon, a 23-year-old law student at Southern Methodist University and a member of the student organizing committee with StudentsMarch.org. Cahoon points to a Quinnipiac poll from February that found 97 percent of Americans support universal background checks. Her hope is that legislators set up a background check system that’s synced between state and federal governments to keep potentially dangerous gun buyers from slipping through the cracks. Cahoon’s next push is the midterm elections in November. StudentsMarch.org will focus on registering people to vote and encouraging them to vote for candidates who support universal background checks in the upcoming congressional and local races. The organization is also focused on bridging the partisan rift that surrounds gun control and the Second Amendment, according to Arlene Gyimah, a 19-year-old college student from Wiley, Texas, and member of the student organizing committee. “We’re really trying to bring awareness to the subject. That’s what I think really creates a divide in this country. If you’re on one side, you know ‘that’s wrong, this is right.’ It just needs to be united,” said Gyimah as she held a clipboard with “voter registration” taped to the back of it. Roughly 50 yards away from the rally outside of City Hall, 13-year-old Nicole Defosse and her 16-year-old sister, Emily, stood with their family under flags that read “Come and take it” and “Open carry Texas.” One flag had the Second Amendment inscribed on its white bars. Both girls shot their first gun, a .22 caliber semi-automatic firearm, by age 10. Over the years they graduated to AR-15s that they held strapped to their bodies during the counter-protest on Saturday. “[Guns] are getting into the wrong hands of the wrong people and people are just misusing them,” said Nicole. Both girls agreed that deeper background checks with more in-depth mental health evaluation and a longer holding period before the purchaser is able to take the firearm home are necessary to curtail gun violence, and that the Parkland shooting could have been avoided if these measures had been implemented earlier.